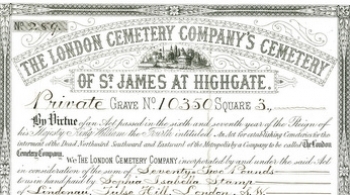 As well as being a beautiful and intriguing site, rich in history, architecture, landscape and romance, Highgate is still an operating cemetery, with up to seventy interments and some thirty to thirty-five plots sold each year. Highgate Cemetery is still open for burial, although there are a limited number of plots available. They may be purchased for immediate use. To buy a plot in advance you must be over 80 years of age or terminally ill.
Full burials: Grave space can only be purchased for an imminent funeral. It is not possible to purchase grave space in advance unless you are over 80 years of age or terminally ill.
Cremated remains: It is not possible to purchase much in advance of need, as the first interment must take place within twelve months of purchase. Relevant legal documentation and certificates must be received prior to any interment. 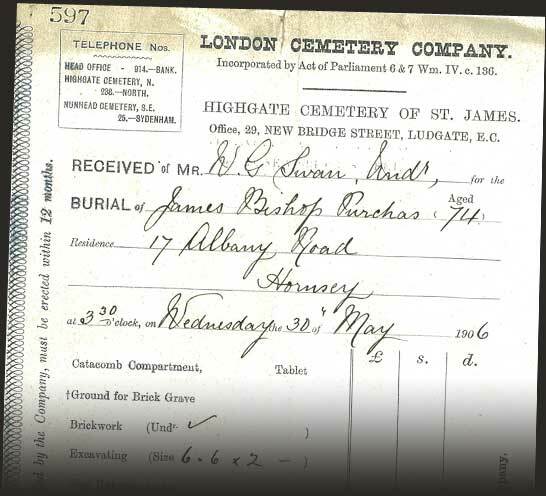 A completed 'application for interment' must be delivered to the Cemetery and fees and charges paid at least five working days prior to the interment. Cremated remains must be buried in a container in a plot, unless they are to be poured by our staff. The scattering of remains is not allowed. Funerals may take place between 10am and 3pm on weekdays, excluding public holidays. If a large number of people is expected at the funeral, arrangers are asked to advise us at least three days in advance so that appropriate arrangements can be made. No demonstrations of any kind are permitted at funerals or anniversaries. Only the person registered as the owner can authorise a burial, unless the burial is to be that of the registered owner. Ownership of the right of burial can only be transferred on the authority of the registered owner or executor, with the consent of the Cemetery management. A limit of two people can be registered as joint owners. There are rules to govern aspects of Cemetery operations, including the safety and conduct of visitors and the procedures relating to burials and memorials. Please make yourself familiar with all of the regulations and ask a member of our staff if there is anything that you do not understand. Our regulations seek to provide a balance between individual rights and the need to regulate for a safe, tidy and dignified environment with respect for both our historic character and the needs of other grave owners. For example, the prohibition of glass, plastics and artificial flowers is based on these items being potential hazards as well as for aesthetic considerations. Please download a copy of our rules here. Memorials should be erected on the grave between twelve to eighteen months after the burial. We are happy to assist with the design, procurement and installation. 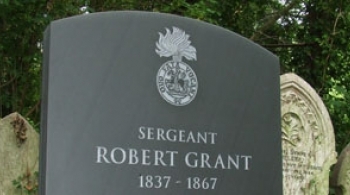 To commission a unique and individually-crafted memorial is not as expensive as you might think. To understand how memorials can be beautiful, take a tour of the Cemetery and see how the design and inscriptions still move you today. Memorials that are personal, unique and in harmony with their environment are works of art. This can apply to the most modest memorial. For many people, commissioning a memorial may be the only opportunity they have for creating a work of art with the living to commemorate the dead. 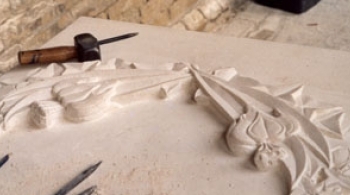 We are fortunate to have the services of a highly talented letter cutter, sculptor and stone mason, Neil Luxton, who has worked at Highgate Cemetery for over 12 years, producing more than 250 memorials. Neil works closely with grave owners to ensure the creation of original and personal memorials. To arrange an appointment to discuss your memorial, please telephone Justin Bickersteth on 020 8347 2471 or email justin@highgate-cemetery.org. Unlike most other activities today, the entire memorial process does not need to be rushed. Highgate Cemetery does not normally install memorials until 12 months after the burial. An official order and deposit of 50% prior to ordering the stone. Delivery of the stone from the quarry (can take up to 16 weeks, depending on the material chosen). 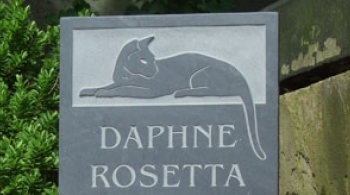 In some areas, only headstones are permitted, with no marble, polished granite or gold lettering. Owners should consult the cemetery before commissioning a memorial to avoid problems later. Grave owners are responsible for the care of the grave and its memorial. Any memorial not kept in good repair may be repaired or removed by the Cemetery at the owner's expense. Memorials and plantings are confined to the area of the grave site, except in the 'The Mound' (Square 122 of the East Cemetery) where planting is restricted to a maximum of 4 feet from the grave head. Artificial flowers, plastic decoration, marble chippings and glass containers must not be used anywhere. Vegetation from surrounding graves must not be removed without permission. Shrubs and trees can be planted on gravesites only with the prior approval of the Cemetery management. Unauthorised plantings may be removed.